With each milestone comes new adventures and new product finds! 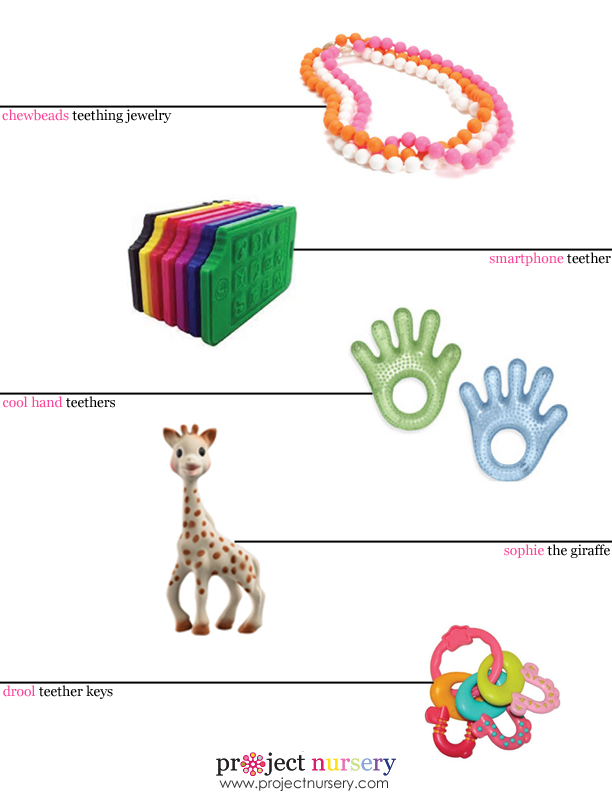 Currently, my ten-month-old and I find ourselves submerged in teethers, and when she’s not chewing on my keys or phone, these are some of my favorite finds for her baby chew toys (and they’re probably a lot safer to chew on too). Chewbeads: This is one of those brilliant, “I wish I thought of that” products! I swear my necklaces are some kind of kiddie-magnet because as soon as I pick up any baby, their sweet little mouths go immediately to my neck. The chewbeads are definitely a safer alternative—made of BPA-free silicone beads, they are 100% safe for baby to chew on. Coolhand Teethers: I love these for two reasons: (1) You can freeze them—the liquid inside gets super cold and feels great on the baby’s gums. (2) There’s usually a variety of shapes available in the liquid-filled teether department, but I love the little fingers on this one—babies can really get them back into their mouths for the hard-to-reach, dreaded back teeth! Jellystone Designs Smartphone Teether: I found this lovely product a few years ago and instantly fell in love with it. Its novelty makes it perfect for gift giving, and its texture, size and flexibility make it the ideal teether for our little ones. Sophie the Giraffe: Sophie was born over 50 years ago; she was the first infant chew toy to hit the market that was in the shape of a giraffe. The shape of its neck and leg is perfect for little hands to hold on to. Also, I swear they put baby catnip inside—every baby I’ve ever known obsesses over this toy. Honestly. Drool Teether Keys: Okay, so Lila doesn’t like these quite as much as my actual keys, but she does enjoy playing with them. They make a fun clicking noise and have different textures on each key to chew on. I still can’t fool her; she goes for the real thing every time. Great picks, Katy! You can never have too many teethers during those phases. For another option…my son loved the Zoli Gummy Sticks too (http://goo.gl/epzpq). I was just thinking about getting one of those amber teething necklaces. I wonder if amber really does work in relieving the pain and discomfort of teething. Anybody here ever tried it? I love the idea of the chewbeads necklaces! Who says moms with babies can no longer wear jewelry? Oh the teething phase…we’re going through that at my house. One of the best things I’ve found are the vibrating teethers. For some reason both of my boys LOVED those! I’ve always wondered about those too, May. Let us know if it works for your baby!